Cancellation more than 3 weeks prior to the arrival day: Booking fee will be charged. Cancellation less than 3 weeks: 50% of total amount will be charged. No show: Full amount of reservation will be charged. Nex Hostel is a newly opened hostel, conveniently located in the heart of contemporary Nicosia and only minutes away from the historic city center. 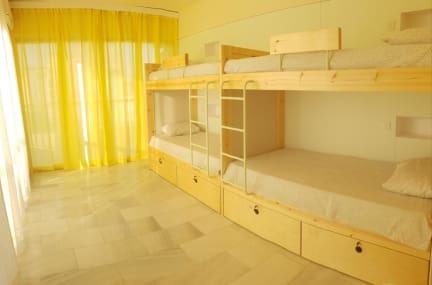 Our hostel is a place offering comfortable, friendly and budget accommodation and at the same time enables travelers to explore Cyprus’ capital and experience the philosophy of a hostel, where people can meet and mingle, share tips and stories and feel like home. Located in a safe, peaceful and classy residential area, close to big embassies, the Parliament and several ministries, Nex offers a world to explore just a stone’s throw away: From stylish bistros and cafés to lively clubs and bars and from museums, galleries and elegant shops to historical monuments and scenic streets. Next to the walking and cycling route that runs along the banks of the Pediaios River and only a pleasant stroll away from the Central Bus Station and the Old Town, Nex offers its guests a great opportunity to explore the multicultural and vibrant city of Nicosia and enjoy all local and tourist points of interest and attractions. The Hostel features three bright and spacious 4-bed shared dorm rooms, with individual lockers, reading lights, plugs and USB ports, a fully equipped kitchen, TV and computer lounges, laundry facilities, two brand-new shared bathrooms and free unlimited WiFi everywhere. What’s more, that makes Nex a really special place to stay, is its large chill-out terrace, enclosing the whole place and accessible by all dorms and common areas, providing views over the city-center and a pleasant shelter to relax, socialize with other guests and enjoy a barbecue.